Few hundred meters down the museum city of Venice is the artificial island of Sacca Fisola. a residential area of 1530 inhabitants made of social housings, connected to the Guidecca island, home to the local penitentiary facility for women. Sacca Fisola takes its origin in the 1960s for use of the working class to keep up with the lagoon demographic growth. The island, that always had a reputation for the communist leanings of its voting age population contrasts sharply with the city of Venice and its gentrification, pushing local people out of the city for the benefit of the real estate sector and the tourism industry. Contrary to the gothic architecture of the Venetian monuments such as the Doges’ Palace, Ca’ d’Oro or Ca’ Foscari, Sacca Fisola is distinguishable by its modernist architecture typical of Corbusier’s housing units in Mediterranean colorful tons. 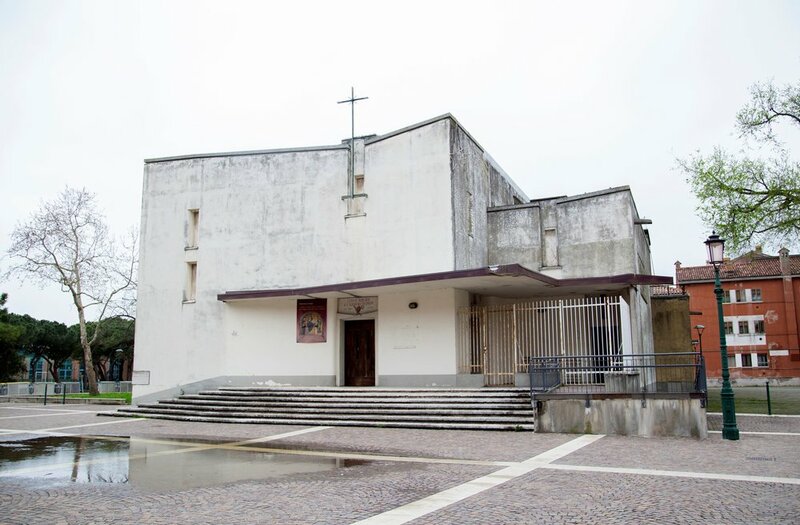 The city also has a brutalist church, the church of San Gerardo Sagredo, 2 cafés and a small harbour where fishing boats are moored. While discovering the island and engaging with the locals, it became clear that the sea plays a significant role in the everyday life of the community. In order not to confine the scope of the project to the walls of the prison, About a Worker went out and about in Sacca Fisola to find out what is the identity of the Venetian people and their relationship to the lagoon. Juliana, 78 years old, Housewife. Leonardo lives in Sacca Fisola but originally comes from the Castello district, east of Venice. He is apprentice taxi-boat driver and spent all his childhood on his faster’s fishing boat. Elio, 77 years old, retired Fisherman. Andrea who speaks a great French is a street artist. Originally from Bergamo, Lombardy Andrea is now juggler around the city of Venice. Unlike other street-artists, Andrea distinguishes itself by its creative process. He prefers to learn different styles instead of persevering in perfecting one technique. Mirco was repairing his boat at the end of the harbor when we met. He is passionate about the sea and worked in Public administration his all life. Now retired, he spends most of his time painting and repairing boats such as this flat-bottom vessel “Barca a fondo piatto” typical of the Lagoon.